Siddhārtha Gautama (Sanskrit: सिद्धार्थ गौतम; Pali: Siddhattha Gotama) was a spiritual teacher from the Indian subcontinent, on whose teachings Buddhism was founded. In most Buddhist traditions, he is regarded as the Supreme Buddha (P. sammāsambuddha, S. samyaksaṃbuddha) of our age, "Buddha" meaning "awakened one" or "the enlightened one." 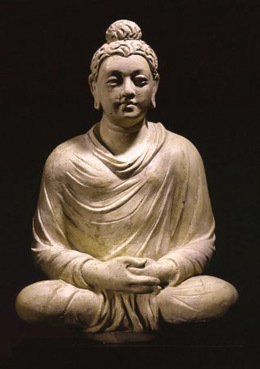 Siddhārtha Gautama may also be referred to as Gautama Buddha or as Śākyamuni ("Sage of the Śākyas"). The time of Gautama's birth and death are uncertain: most early 20th-century historians dated his lifetime as c. 563 BCE to 483 BCE, but more recent opinion dates his death to between 486 and 483 BCE or, according to some, between 411 and 400 BCE. UNESCO lists Lumbini, Nepal as a world heritage site and birthplace of Gautam Buddha. There are also claims about the birth place of Gautam Buddha to be Kapilavastu at Piprahwa, Uttar Pradesh, or Kapileswara, Orissa, modern India. He later taught throughout regions of eastern India such as Magadha and Kośala. The thought manifests as the word; The word manifests as the deed; The deed develops into habit; And habit hardens into character. So watch the thought and its ways with care, And let it spring from love Born out of concern for all beings.